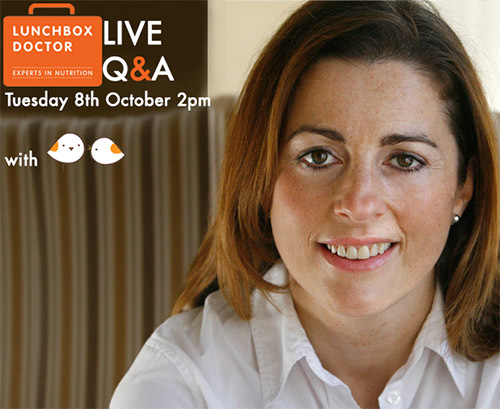 Last week you may have noticed that we were having a live Q&A with the founder of Lunchbox Doctor, Jenny T – one of the UK’s leading nutritionists! We’ve teamed up with her over the past few months to give you healthy lunchbox tips to get you and your family saving pennies, eating healthier and inspiring you at home! You can find all of LittleBird & The Lunchbox Doctor’s tips all in one bundle here. On Tuesday (8th October) we had a Live Q&A with Jenny! We know that sometimes it’s a real struggle to get the little one’s eating fruit & veg or to convince your child to eat new foods. A: A great way to encourage children to eat a variety of vegetables is to get them to make a vegetable face. These knives from The Pampered Chef UK are useful for safe chopping. Once they have made a face they can then eat it piece by piece! A: Picky eating is a normal part of childhood however with some it can provide a barrier to healthy eating. I would advise firstly using an age appropriate multi-vitamin such as this one: Biocare Children’s Complete Complex This should help boost natural levels of nutrients. Sometimes fussiness around foods and wanted more strongly flavoured food can be indicative of zinc deficiency. I would also advise trying to introduce some of the foods he is less keen on in a more familiar format. To start with using vegetables grated in pasta sauces or in baked goods can help. A question I am often asked is “how do I get my little one to try wholemeal bread?” Well, I like to use the hare and the tortoise analogy. Say the hare eats a white bread jam sandwich for his lunch. He goes haring off and then falls asleep under a tree. He has had a burst of energy followed by a sudden drop in energy. Now say the tortoise has eaten a wholemeal sandwich with tuna in it. The fibre from the wholemeal bread and the protein in the tuna both act to slow down the release of sugar into the tortoise. He has a consistent level of energy that lasts him all afternoon. We want our children to be more like the tortoise and less like the hare. This means they will have energy, more consistently, for longer. This more consistent level of energy is linked to improved concentration and behaviour in school. I would recommend you get him allergy tested for bakers yeast. There are many alternatives but it would be good to know what you are dealing with if it is an allergy specifically. A: Soya milk is not made using fermented soy. For the full benefits of soy in anyone’s diet they should choose fermented soy products such as miso, tempeh, tofu and soya sauce. These products provide the plant-based chemicals that are good for us. Soya milk, yogurt etc doesn’t. Furthermore there’s the link with potential hormone disturbances. The jury is still out on this but one thing I advise against is replacing all cows milk with soya milk. If you are replacing cows milk then choose a variety of different non-daity milks to substitute with i.e. oat, almond, coconut, rice etc. Hope this helps. A: So long as she eats a variety of vegetables I shouldn’t worry about no fruit. Variety should be in terms of colour. Each different colour provides a different type of beneficial plant-based chemical. Spots can be indicative of a slightly sluggish system. A course of probiotics such as Bio Kult might be helpful as would a diet rich in cruciferous vegetables, onion, garlic and beetroot. A: Low immunity can be linked to low zinc levels and low vitamin C. Zinc is found in eggs, seafood, nuts and seeds so providing these things in his diet can help. Nut butters (providing no allergy) are great on toast and provide a good protein, zinc and fat hit. Vitamin C is in fruits and vegetables. Smoothies made with some natural yogurt for protein and lots of colour could help both build him up and boost his immunity at the same time. A: I recommend switching to goats and sheeps dairy to start with i.e. manchego, halloumi (Cypriot), pecorino and goats cheese as well as yogurts from sheeps and goats milk. Also interchange some non-dairy alternatives such as oat milk, coconut milk, rice milk and specifically almond milk. Q:What should go into a healthy, balanced lunchbox? Carbohydrates: includes pasta, rice, bread, potatoes, oats and some lesser known foods such as quinoa and buckwheat.